Jeffrey L. Elegant focuses his practice on commercial finance transactions, from loans and public offerings to workouts and insolvency matters. With more than 30 years of experience in commercial lending and bankruptcy, Jeffrey has represented a wide variety of clients, primarily in the financial services industry. A significant portion of Jeffrey’s practice is devoted to the representation of publicly traded and privately held businesses and financial institutions in syndicated commercial finance transactions, leveraged buyout transactions, asset-based lending, asset securitizations and equipment financing. Jeffrey represents both senior secured lenders and mezzanine lenders in these transactions. He also handles private placement of debt and Rule 144A transactions. In 2012, he assisted in the commercial finance aspects of a $65 million public offering of depository shares from a middle market bank. Jeffrey also represents lenders in the workout and creditors’ rights areas, debtor-in-possession financings, and Uniform Commercial Code (UCC) foreclosure sales. 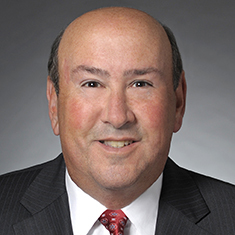 He has been involved in numerous industrial revenue and housing bond financing transactions, serving as counsel to credit enhancers, underwriters and borrowers, as well as representing financial industry clients in regulatory matters.